2018-19 record: 28-6, Mountain West regular-season co-champion, conference tournament champion. Series record: Washington has a 3-5 record against Utah State. The Huskies have played the Aggies only once since 1986, a 75-61 victory in the 2006 NCAA tournament. 10 – Consecutive games the Aggies have won, which is tied for the eighth longest winning streak in the nation. 9 – Where Utah State was picked to finish in the 11-team Mountain West in a preseason media poll. 8 – Years since the Aggies appeared in the NCAA tournament. Early line: Aggies by two points. G Sam Merrill: The Mountain West player of the year averages 21.2 points, 4.2 assists and 4.0 rebounds a game. The 6-foot-5 junior guard is an excellent marksman who shoots 46.5 percent from the field, 37.8 percent on three-pointers and 90.7 percent on free throws. He’s the only player in the nation shooting at least 46 percent from the field, 37 percent on three-pointers and 90 percent at the line. He is one of just six players to do that in the past 22 years. In the past seven games, Merrill is averaging 26.7 points. During that span, he’s had 38- and 32-point outbursts. In three Mountain West tournament games, Merrill averaged 23 points, 5 rebounds and 5 assists. C Neemias Queta: The 6-11 big man won the Mountain West defensive player of the year award and freshman of the year honors. Queta, a product of Barreiro, Portugal, has transformed Utah State into a defensive juggernaut. He averages 8.9 rebounds and 2.4 blocks a game, which ranks 14th nationally. Queta also is an unstoppable force offensively who scores 11.9 points a game and shoots 62.7 percent from the field. F Quinn Taylor: The oldest (25) and longest-tenured Aggie who has appeared in 128 games the past four years. The 6-8 senior from Houston averages 8.0 points, 6.2 rebounds and 2.2 assists. Taylor was recruited by USU legendary coach Stew Morrill and began his playing career in 2015-16 after serving a two-year LDS church mission in Sao Paulo, Brazil. Dwayne Brown Jr., who played his first two seasons at Northern Oklahoma Tonkawa JC, is the only other senior on the roster. In his first season in Logan, Smith has led the Aggies to 28 victories, which is tied for the third most in school history. Smith, who spent the previous four years at South Dakota State, won the Mountain West coach of the year award. 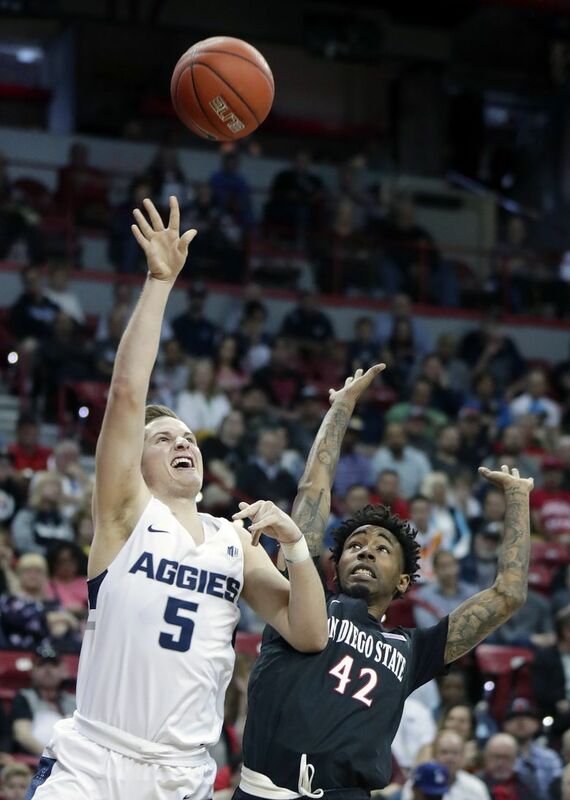 Utah State was overlooked and discounted at the start of the season and started with five consecutive victories before running into Arizona State and losing 87-82 at the MGM Main Event in Las Vegas. In that game, Luguentz Dort scored 33 points for the Sun Devils. Merrill tallied 27 points, 5 rebounds and 5 assists. USU went 4-4 over the next eight games, including a 60-50 defeat against No. 21 Houston and a 72-49 defeat at No. 6 Nevada. Since then, Utah State has won 17 of its past 18 games, which includes a 10-game winning streak. The Aggies are No. 29 in the NET ranking. They went 3-2 against Quadrant 1 opponents, 2-3 versus Quadrant 2 foes and 22-1 against everybody else. USU ranked 25th in the nonconference strength of schedule, but a weak Mountain West drops their conference strength of schedule to 101. Utah State averages 79.2 points, which ranks 42nd nationally. USU also averages 17.2 assists, which ranks 10th in the country. Since 1998, USU is 1-9 in the NCAA tournament. The Aggies’ last NCAA tournament victory came in 2001, when they stunned Ohio State 77-68 in overtime. On importance of getting the No. 8 seed: “There’s just so much pride here. Utah State has been to, this is now 21 NCAA tournaments. Stew Morrill has been unbelievable. It means so much to be able to restore what we want to do. It’s a new era, being in the Mountain West, and getting back to what expectations are that way. This group of young men made history and they’ll always have that bond. We want to really connect our team and the program with the greats.